Did you know sugary drinks are the #1 source of added sugar in our diets? Our collection of resources will inspire you to choose water and drink less sugar-sweetened beverages. Check out these tips from MyPlate.gov to get you started! Drink Water: Drink water instead of sugary drinks. Regular soda and other sweet drinks usually contain a lot of added sugar which provides more calories then needed. A Thrifty Option: Water is usually easy on the wallet. You can save money by drinking water from the tap at home or when eating out. Water On The Go : Water is always convenient. Toss a reusable water bottle in your bag to quench your thirst throughout the day. What you drink is as important as what you eat. Choose water first for thirst! The Many Names for Sugar! Reading the ingredient label can help to identify added sugars. 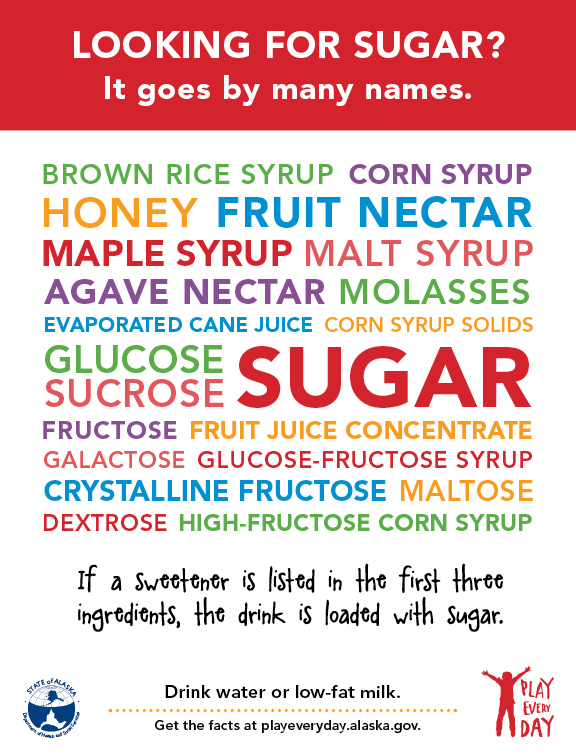 Names for added sugars on food labels include these! Jazz up your water with these recipes! Make drinking water more fun by flavoring it with fruits, vegetables, or herbs. Did you know a 20 ounce bottle of sweetened tea contains 14 teaspoons of sugar? Redo Your Coffee Shop Stop! Whether going to your local coffee shop is a daily ritual or a special weekend outing, consider these ways you can move toward better choices.